The KEMLg is one of the groups featured in a special section of "La Vanguardia" newspaper, titled "Catalunya TIC Innova" (Catalunya ICT Innovation), published on Monday February 27 2012. The article summarizes the group's work and objectives since its creation, its research areas and projects, and its collaborations with companies and institutions. The article also mentions the involvement of the group in SUPERHUB, a European project on intelligent systems for eco-efficient urban mobility in the SmartCities context. 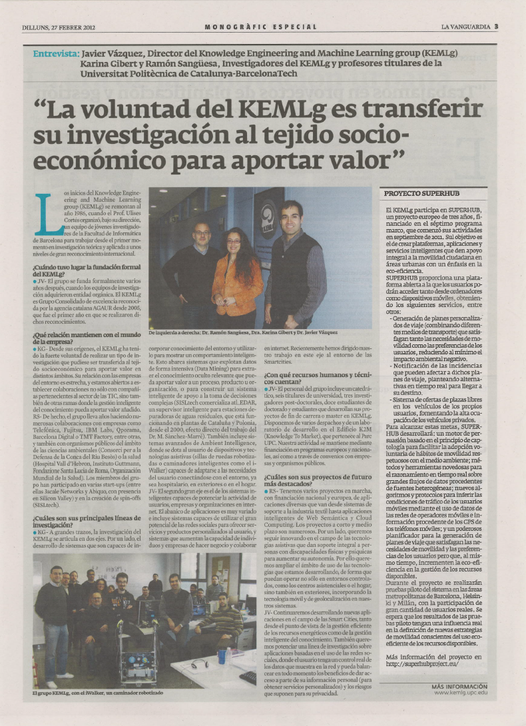 The special section, with a circulation of over 400,000 copies, is distributed as part of the National edition of La Vanguardia newspaper, and also to the attendants of the Mobile World Congress in Barcelona.